Welcome aboard your June issue of World of Cruising! To get you in the holiday mood, we’ve picked the dreamiest Greek islands and the most amazing wildlife you can see when you’re out on deck. We’ve explored Viking’s chic new cruise ship and been entertained to a right royal variety of shows on Princess. 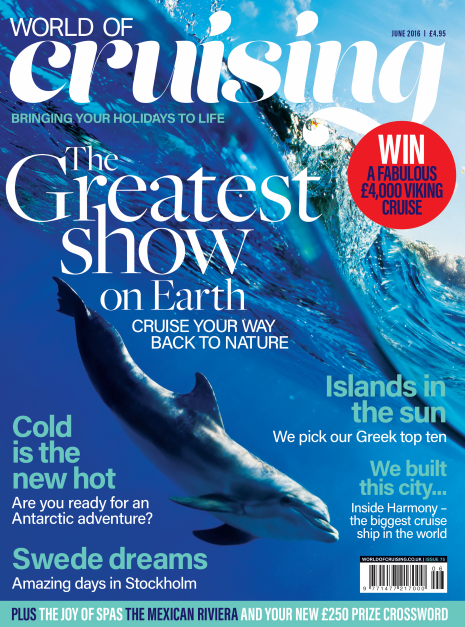 We’ve also got the inside scoop on Harmony, the recently launched biggest liner in the world. Our writers will take you waltzing in Vienna and shopping in Sorrento, and there’s a touching story of cruise fans and their final journey. Celebrity adventurer Ben Fogle shares his travel tales and we have a special report on Antarctica, cruising’s hottest new destination. I’m sure you’ll find something to inspire you – and I’d like to thank all of you who’ve already sent in comments on the new-look magazine. I’m so pleased you’re enjoying our extra fashion, shopping and books pages – but we’re not stopping there. We know that cruisers love a puzzle, so in this issue we’re introducing the Cruise Crossword, with a £250 cash prize every month. Think of it as a down-payment on your next holiday!